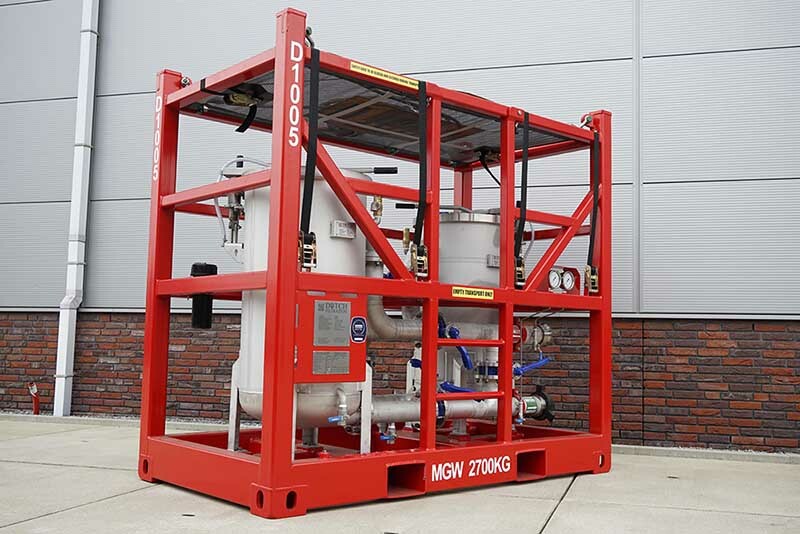 Dutch Filtration produces filter equipment offshore industry cannot live without. In oil and gas production operations on offshore platforms produced water is the largest volume waste stream. 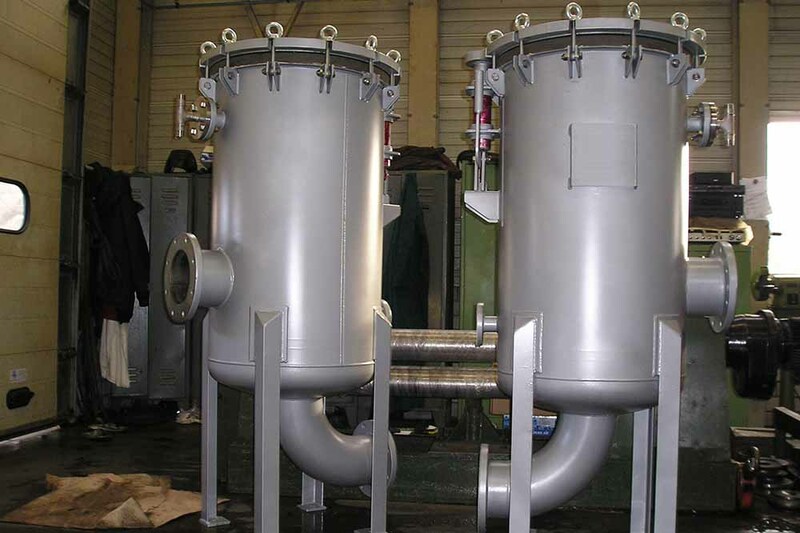 Dutch Filtrations offers a full range of filter equipment that is designed and manufactured to meet the most demanding quality standards of the oil and gas industry for use both on- and offshore. 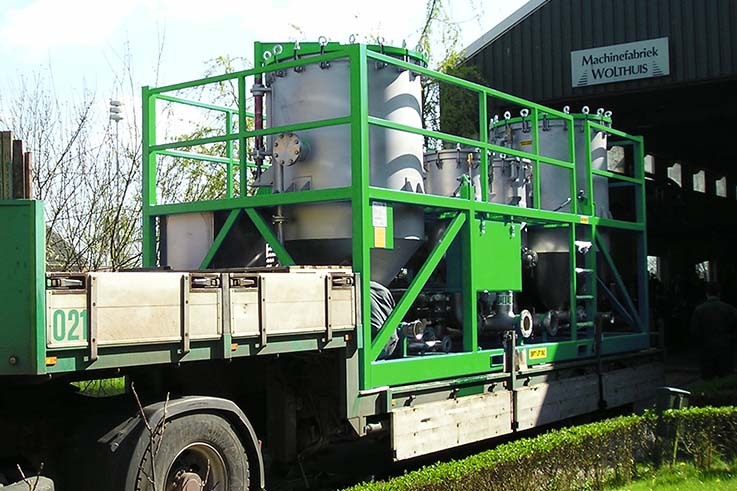 With our filter equipment offshore industry can minimise their footprint, because we design products of the highest quality that have the best results filtering the waste stream. We design, innovate, engineer and manufacture in-house, which results in a flexible organisation which listens to their customers. We offer the maximum commitment and flexibility to achieve customer agreement. When our team assist you during the start-up and operation process of our filter equipment, offshore industry requirements are taken into account. We can give on-site training and we can help you with troubleshooting techniques. We offer product support post production and installation on- and offshore. Seawater is obviously the most convenient source for offshore production facilities, and it may be pumped inshore for use on onshore fields. Where possible, the water intake is placed at a sufficient depth to reduce the concentration of algae; however, filtering, deoxygenation and biociding is always required. 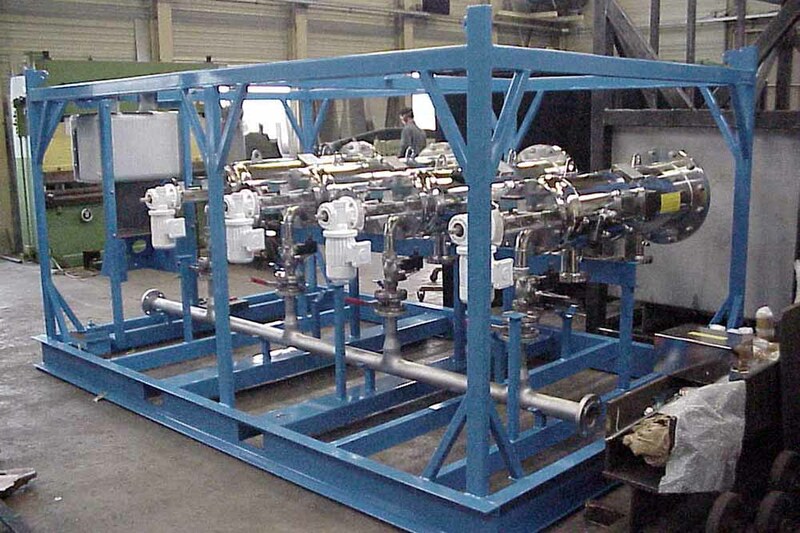 For all those processes we offer the filter equipment offshore industry needs. The new dual vessel cartridge filter unit is especially designed and manufactured for oilfield filtration services. With our unique design features such as the Rudi quick opening closure, the filtration operator will be able to work more safe, faster and ergonomic. The combination cartridge bag filter unit has the unique advantage of being used for bag filtration as well as cartridge filtration. This flexibility will allow the combination filter unit to be used for many different filtration applications. Pre- and polish with bags and or cartridges in one unit. This unit is equiped with the Rudi QOC for safe and quick change out of consumables. The new dual vessel bag filter unit is especially designed and manufactured for oilfield filtration services. With our unique design features such as the Rudi quick opening closure, the filtration operator will be able to work more safe, faster and ergonomic. Our filter press is the most reliable DE filter unit available in the market to filter large volumes and high dirt load fluids. The filter press is available from 600 sqft upto 1600 sq.ft. Our standard 4inch connection size for flow rates up to 18 BPM, our larger size 1400-1600 sq.ft. are availble with special high flow designs for flow rates up to 32 BPM. The frame is DNV 2.7-1 certified by LR or DNV. 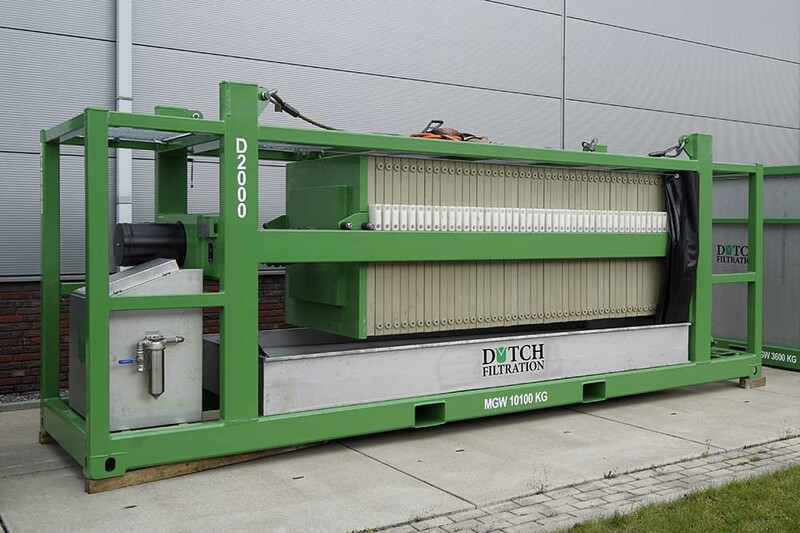 The Dutch Filtration dual mixing slurry skid is a complete unit for pre-coating and body feed the filter press, DNV2.7-1 certified . The unit is complete with 2x 2.3m3 mixing tanks, air driven pre-coat and body feed pump and equipped with large & safe working platform. This unit can be combined with the dual vessel cartridge unit in one frame to save footprint and stacked onto a standard Filter Press. The diesel driven pump set is designed to work in the most harsh conditions. The air cooled 4 or 6 cylinder diesel engine is reliable and easy to maintain. 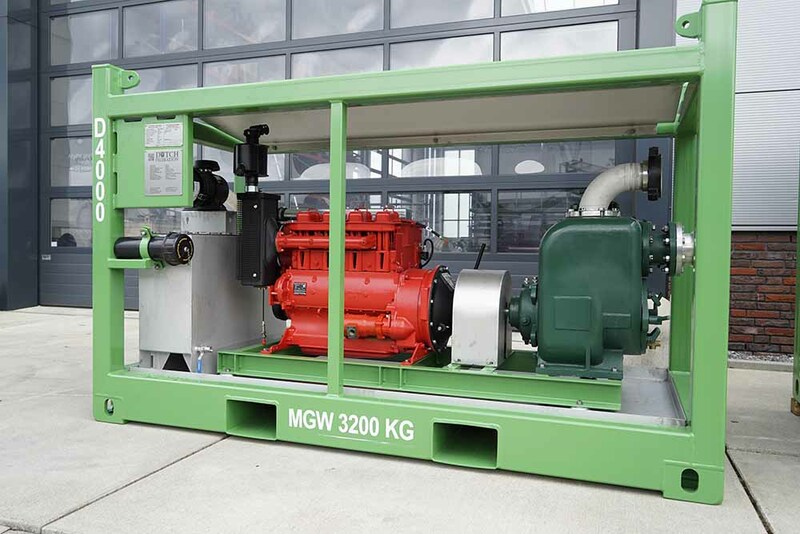 The diesel engines are mounted to heavy duty self priming pump from Pioneer or Gorman Rupp. The pumpset is built into a DNV2.7-1 certified frame complete with stainless steel daytank and air starter. 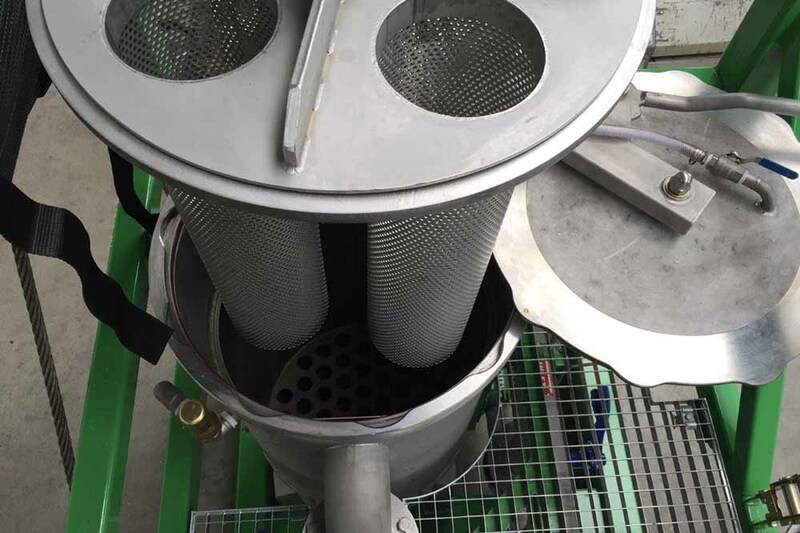 The cartridge or bag filter vessel are used in many applications such as pre-filtration RO, Bilge Water Polishing, Water Injection, waste water treatment. The vessels are manufactured in several kind of construction materials such as Stainless steel, super duplex or carbon steel. 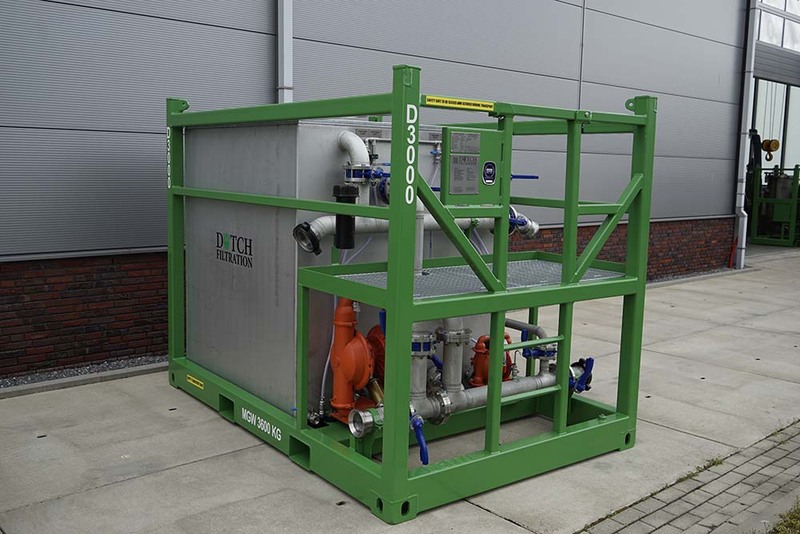 Dutch Filtration manufactures a complete range of Vertical Pressure Leaf filter units, from 400 up to 1600 sq.ft. unit, with or without cartridge filter vessels included. The compact footprint has many benefits over the filter press. Pumps and Mixtanks are built into one frame. Dutch Filtration manufactures complete solutions. 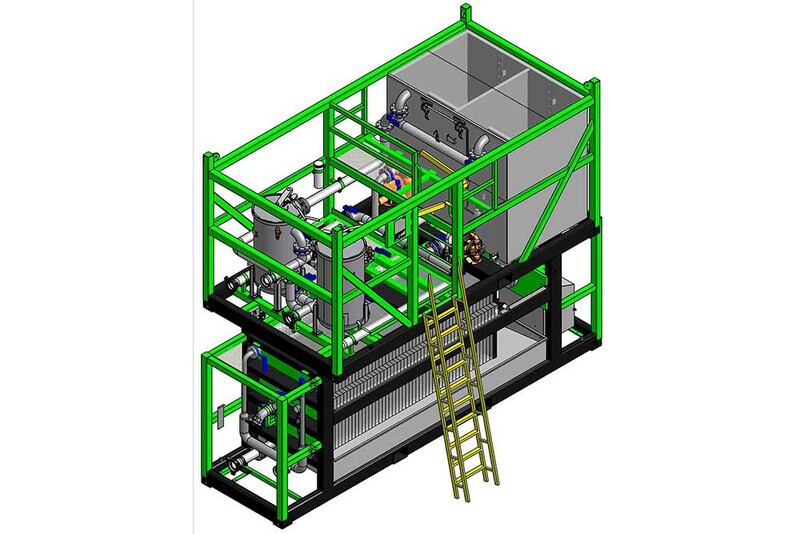 The stackable dual mixing slurry skid can be placed on top of the filter press. 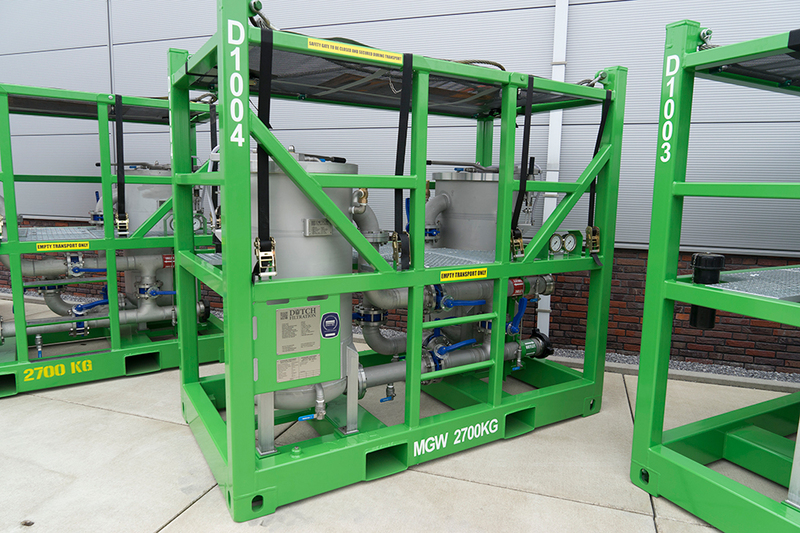 The stackable mixing slurry skid is combined in one frame with two cartridge filter vessels. With this set up you need minimum footprint during operation. Do you have questions or do you want more information.